Allison Sheridan is perhaps best known for Podfeet Podcasts, Technology Geek Podcasts with an EVER so Slight Apple Bias. Since 2005 her NosillaCast podcast has come out weekly without fail. Outside of her extensive podcasting career, Allison also has decades of experience in IT. 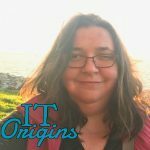 In this IT Origins interview, we discuss her move from mechanical engineering to IT, the gradual departmentalization of IT throughout her career, what is IT’s role in business, and the liberating definition of waste. Plus, make sure to catch your humble interviewer give one of the most awkward definitions of DevOps! If you’re interested in the books Allison recommends in this interview, check out First Break All the Rules and Now, Discover Your Strengths. You can follow Allison on Twitter, and find all of her podcasts here.